At this time of year, the weather typically cools just a bit in Bangkok. Those native to the area feel the 'chill' in the air. The rest of us breath a sigh of relief as the humid steam lessens a bit. As I write this a super typhoon is approaching the Philippines and all of southeast Asia is having some unusual weather. Paired with the natural seasonal cooling, we are experiencing our third day of near constant drizzling rain. Usually, at this time of year, it will rain (hard and heavy) for about an hour in the afternoon or for several hours overnight. But, it is strange here to experience a day where you find yourself under constantly misty skies. My youngest has little to no recollection that this was the normal weather pattern for much of the year when we lived in Seattle. Having moved to Thailand when he was two years old, he doesn't remember days spent in the drizzle. He looks out of his Bangkok bedroom window and says, "Let's just wait it out mama. No sense in getting wet." While my daughter, being slightly older when we moved, has strong (and fond) memories of the rain and is approaching Bangkok's unusual rainfall with typical Seattle-ite gusto declaring it a perfect 'color at the coffee shop sort of day'. With a firm grip on his spiderman umbrella, my son agreed to the coffee shop outing as long as his favorite matchbox car could come too. A big stack of coloring books and the diminutive car journeyed with us. We sat at the window and sipped hot cocoa as the rain continued to drizzle down. My daughter constructed roadways with crayon borders for her brother's car while he intently instructed that he needed a stronger curve or a longer path to race on. We eventually returned home for a day of play, crafting and ongoing big batch cooking projects. 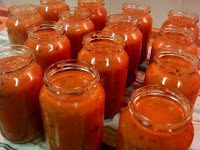 By dinner time, the freezer held twenty new glass containers of fresh tomato sauce ready to be dispatched for pizzas, pastas and consumed as is for tomato soups in our near future. And, by bedtime, everyone in the house was still smiling and happily exhausted from a fun day. While I tucked my son into bed he looked at me and said, "Let's hope it rains again tomorrow." There are hundreds of variations on this recipe available. But, especially since moving overseas and not enjoying the tomato sauce brands available to us, this recipe has become a staple to keep on hand in our freezer. We use it on our homemade pizzas, on top of pasta dishes and paired with grilled cheese sandwiches as a garden fresh tomato soup. Off of each head of garlic, slice the upper 1/4 off and discard, creating a flat top. Place all heads of garlic into a double layer of aluminum foil, lined with parchment paper. Drizzle with 3 tablespoons of olive oil and a pinch of salt. Wrap tightly and place into a 200 degree F oven for one hour. Remove and allow to cool. Once cool, remove the cloves from the garlic skins. In a very large stock pot, add the garlic and all of the onions, roughly chopped. Add a bit of olive oil and cook until very light golden in color. Add tomatoes, remaining water, remaining olive oil, the red pepper flakes and several generous pinches of salt. Cook at a low simmer, stirring occasionally for one hour. Allow to cool. 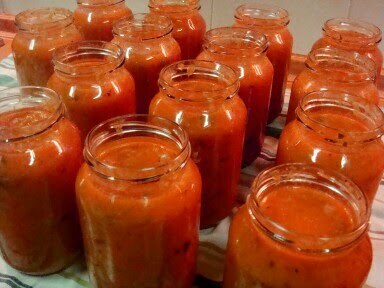 Working in batches, place the sauce into a blender and process until smooth. Transfer to another large pot and continue until all of the sauce has been blended. Finely chop the basil leaves and add to the blended sauce. Taste and add salt as needed. Pour into glass jars (leaving a bit of room), top and place into the freezer for later enjoyment! Drizzle is annoying though--I would almost prefer real rain. The tomato sauce sounds delicious!! Our crop of tomatoes this year with our cold summer was pitiful. It was strange to not have the rattling of the air conditioning going all day and all night! Fun to pretend like it is cold. Thanks for the post. Sounds like a great day! That looks delicious. Can you find good tomatoes here? I haven't looked a lot, but every time I see them at the market they're not great. Hmmm...this may or may not come through. Blogger is telling me something in Thai that I can't read. I was just saying this look delicious and asked, more or less, where you can find good tomatoes. Mine will be two and five when we finally get there-I wonder how they'll take the weather! @Heather: Moving to Bangkok? My kids adapted pretty well to the weather. In fact, my daughter (now 6) wears a lightweight sweater daily over her school uniform now and doesn't seem to mind the heat. That being said, she also dreams of moving to a cooler climate saying, "I hope our next home is REALLY cold!" @Megan: YES! As you've found out, tomatoes can be found year-round in the outdoor markets in Bangkok, but now is the time they are actually GREAT. I shop at Or Tor Kor (the big green market near the Mo Chit skytrain station, across from Chatuchak's Weekend Market). It's open daily and a wonderful place for fresh veggies. Really worth the excursion even if you live a bit away. Avoid the supermarkets for your tomatoes... just blah flavored!